There are numerous mosques all around the world. Each has a design of its own. However, in order to be distinctive from other mosques, a mosque needs to be unique and possess outstanding features. 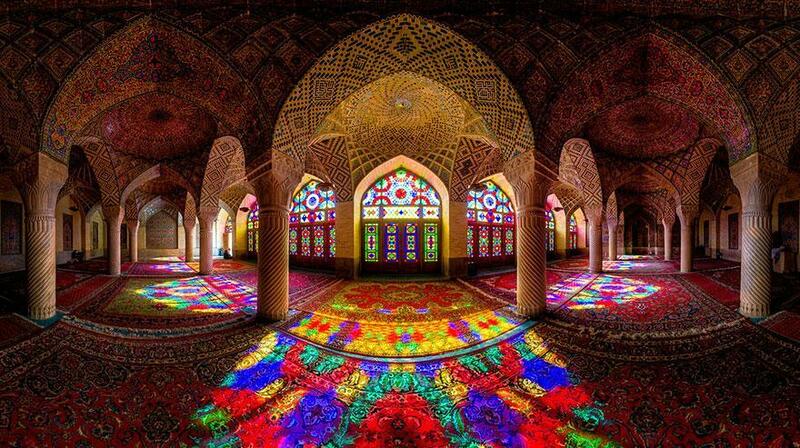 One such mosque is The Nasīr al-Mulk Mosque in Shiraz, Iran. The mosque is called by many different names. Mostly known as the “Pink Mosque”, it is also called the “Mosque of colours,” the “Rainbow Mosque” or the “Kaleidoscope Mosque”. This is a space where light and worship intertwine. The mosque comes to life with the sunrise and colours dance throughout the day like whirling dervishes. It reflects on the ground, walls, the arches and the towering spires. It even reflects on the visitors as if a colourful ball is hit by the first sun ray and explodes to thousands of butterflies all around. The original name of the mosque in Persian is Masjed-e Naseer ol Molk. Wikipedia mentions it as an ordinary Iranian mosque; however, the interior hides an impressive piece of architecture and design.